When we went to bed around midnight, only a few inches of snow covered the ground. The last thing I heard was meteorologists promising things were about to ramp up, and that we’d wake up to a blizzard. They were so right! For some reason, it didn’t seem as daunting as the one we had in 2013. But maybe that’s because I’m sitting here on the back end of it, and still have power. 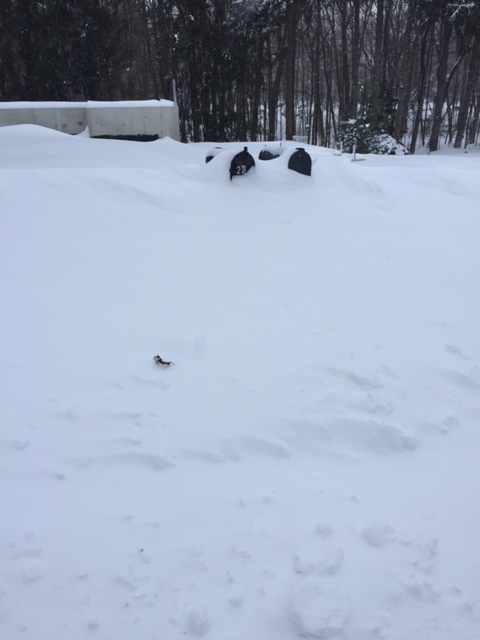 We also have a snowblower now, so instead of two people spending 6 hours a piece shoveling out the driveway and walkways and clearing off cars, it took my husband about two hours. And even though he grumbles about how much he hates snow, I think he secretly likes to use the snowblower. 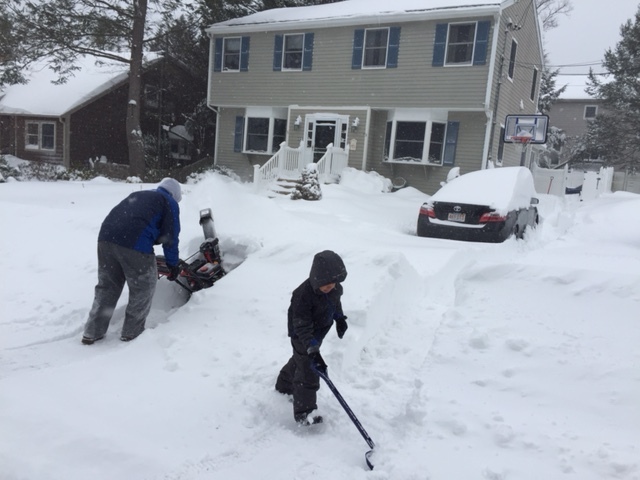 Snowblower + tiny shovel = teamwork. While my husband worked on the driveway and unearthing our cars, my son and I took a walk around the neighborhood with the snow still swirling around us. We marveled at the size of some of the drifts. Superhero was all, “WHOOOOOOOAAAA!,” his voice echoing over the loud buzz of several snowblowers at work on our street. The news peeps were like, “You shouldn’t go outside unless you have to.” But dude. We HAD to. It was too awesome to stay inside, and we were bundled up nice and warm. But the best part of the day was when the work was done and we could all play. 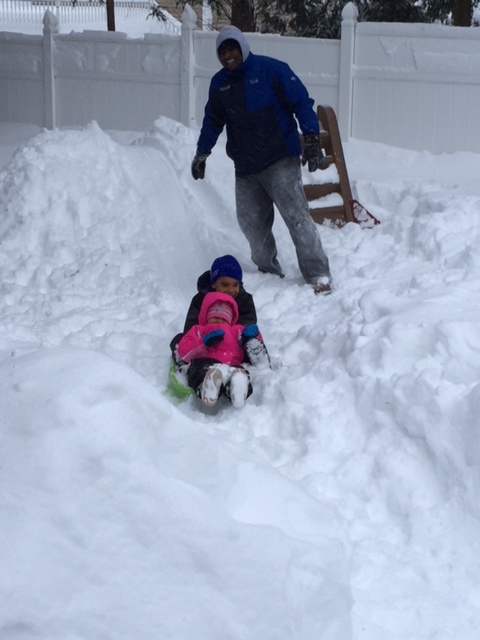 The hubs built a little sledding hill in the back yard, and when Sweet Pea woke up from her nap, it was on. Soon after, several friends from the hood came over to play. 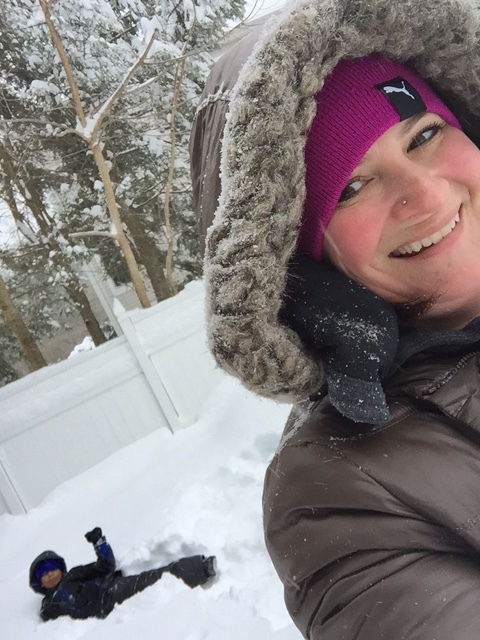 There’s nothing like a yard full of kids, giggling and laughing, disappearing and reappearing from behind huge piles of snow, climbing drift piles and having a blast. After dinner, both kids nearly passed out in their beds. Snow play is exhausting, man. No school tomorrow, so I expect we’ll be doing more of the same. I’m always ready for spring when it finally arrives, but for right now, I’m firmly, happily planted in winter. 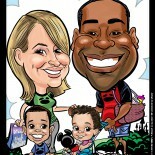 This made me smile! I’ve never experienced snow like that. Enjoy!!! Sounds familiar–27″ at my house! It’s amazing to be in the middle of winter. I love it. Thanks for reading and commenting, Marcia. 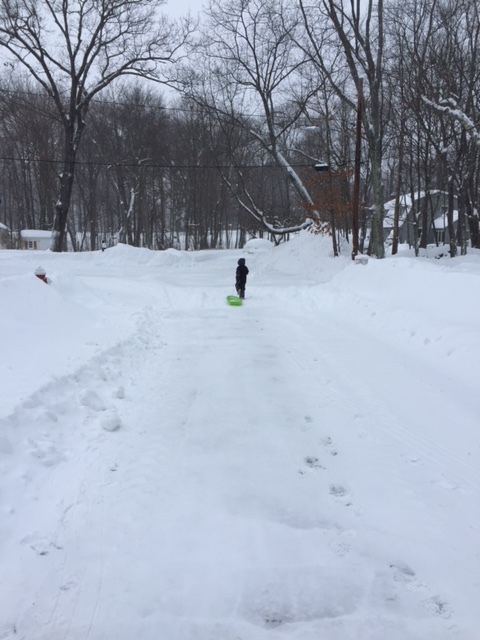 This entry was posted on January 27, 2015 by Maisy Fernandez in Kids, Weather and tagged Blizzard of 2015, sledding, snow, snow play, snowblower, winter.